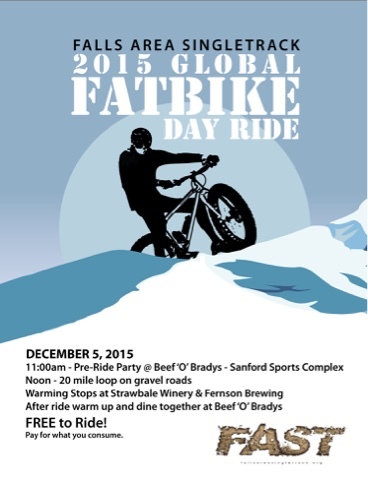 It begins with a Global Fatbike Day Ride at 11am from Pizza Ranch in Brandon. It continues with a FAST Annual Meeting in the Holiday Inn Cascade Room. Trail Maintenance Thursday Tonight at Leaders Park. 6-7:30. It's been a while since we've given our members/volunteers and followers a comprehensive update. Over the past few years our core efforts have been maintaining Leaders Park and improving the existing trail. During 2015 we signed a new usage agreement with the City of Sioux Falls for Leaders Park that is good through 2020 with an option for extension through 2025. The future of your existing trail is secure. Also during 2015, FAST started work on a new proposal to build new and maintain existing rogue trail along the Big Sioux River and more specifically Yankton Trail Park, West Tomar Park and Tomar Park. We're happy to announce that a new usage agreement is in place for FAST to do so in Yankton Trail Park and West Tomar Park. Our proposal for Tomar Park was not approved as there's pending activity and a proposal with the Disc Golf Association for that property. Some of you likely helped ride in a nice fat bike snow trail this winter in that location where we had proposed to build trail. 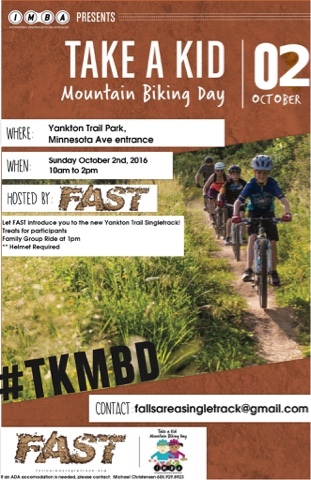 Yankton Trail - There's rogue trail that is fun to ride between the bike trail and the river. Our plan is to add trail where there's space and improve and maintain existing trail. The result will be over a mile of new, directional single track with some areas of two track / two way trail. It's a tight corridor and our plan is to maximize the space and create something everyone can enjoy. Tomar West (just east of Minnesota Ave.) - Another chunk of dirt that begs for a combination of single track and a skills course with obstacles etc. Still finalizing plans on this section. More to come. Leaders Park - Continue maintenance, repairs and erosion control as needed. We're currently working to rebuild or replace one of the broken ladder bridge obstacles. Our Social Media Posts have indicated we'll need volunteers for current and future projects. We will have Trail Maintenance Thursday at Leaders Park tonight (3-17-16) from 6-7:30. 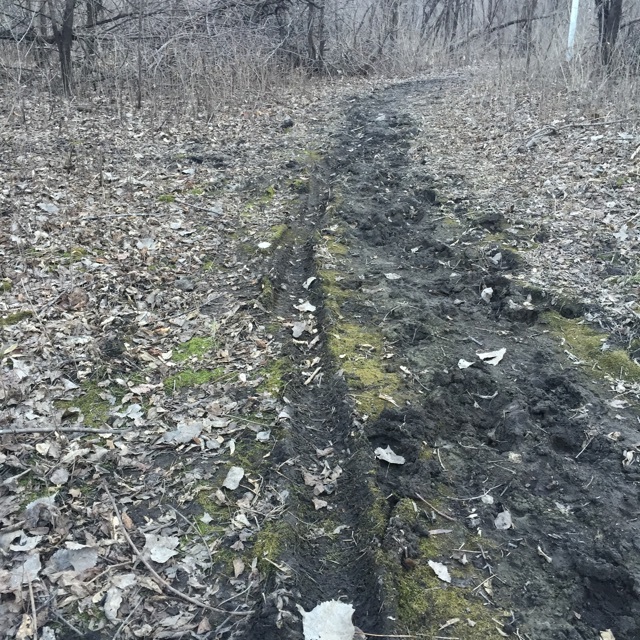 Trail marking has started at Yankton Trail Park from the Minnesota Ave. trail head and we'll be calling for volunteers soon when we can establish some build dates. Volunteer SWAG is in the works and we'll have a limited number of Trail Crew shirts and gloves coming to maintenance and build sessions this year. 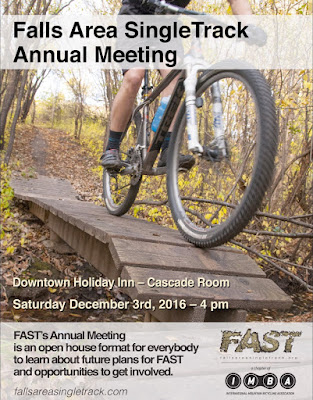 Member Meeting - FAST would like to hold a member meeting and open house in April to connect with the local trail user community and discuss current and future opportunities. Dates/Time TBD. Stay tuned for updates. IMBA Meeting - FAST, along with other regional organizers will be meeting with our Region Director from the International Mountain Bike Association in early April. IMBA and FAST both stand to learn and share information about current development and future opportunities in and around Sioux Falls. We'll share what we learn at our member meeting. Recently, FAST added a new board member at large, Ron Paul Dezell, whose passion and hard work have made a big difference over the last few years as a member and now board member of FAST. We're meeting December 5 at 11am at Beef 'O' Brady's and going for a ride. Thanks to some hard work by our volunteers and board members, Leaders Park is riding really well right now. Some of us were making laps last night and enjoyed the new bermed corners and added bridge on the bypass. No trail maintenance tonight but we hope to regroup next week for a session! Again, big thanks to our volunteers - Ron, Mike, Brandon, Ryan, Ben, Bob, Adam among others. There will be Trail Maintenance Thursday @ 6pm at Leaders Park this week 6/25/15. Meet at the sign/kiosk at trail head near community garden. Volunteers welcomed and appreciated. We'd suggest long pants, gloves and safety glasses. Unfortunately it's still a little too wet to ride out at Leaders Park. 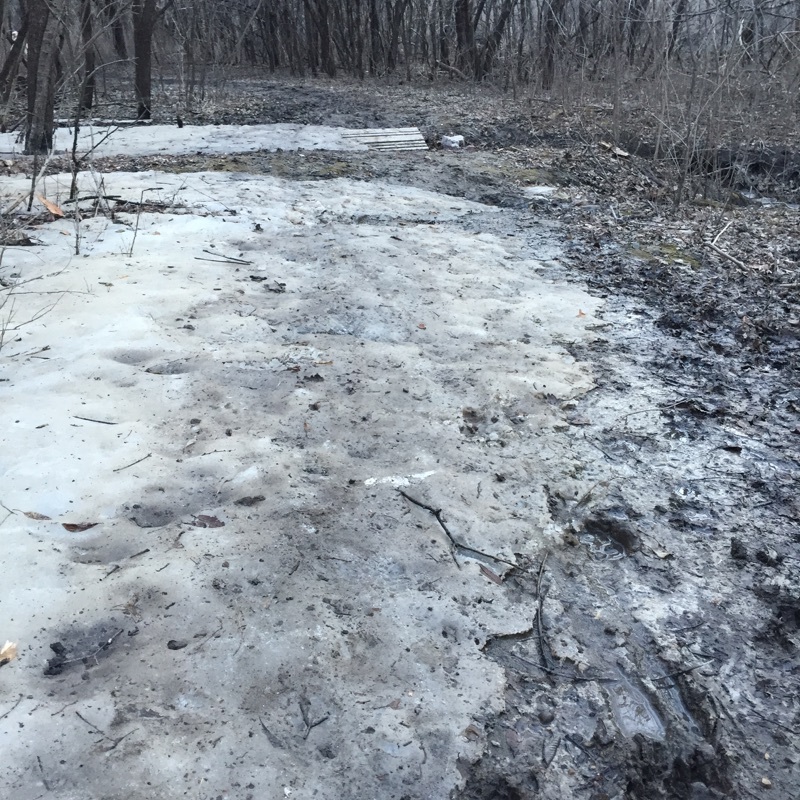 Please give the trails time to dry out as the frost continues to work its way out of the ground. A quick walk of the park last night reminded us that even with the warm and windy conditions this spring we'll all need to be patient. Some parts are totally dry and other sections still have, ah, snow. Riding wet trails leaves ruts behind that have to be repaired. It could be another week-to-ten-days before things are dry enough. 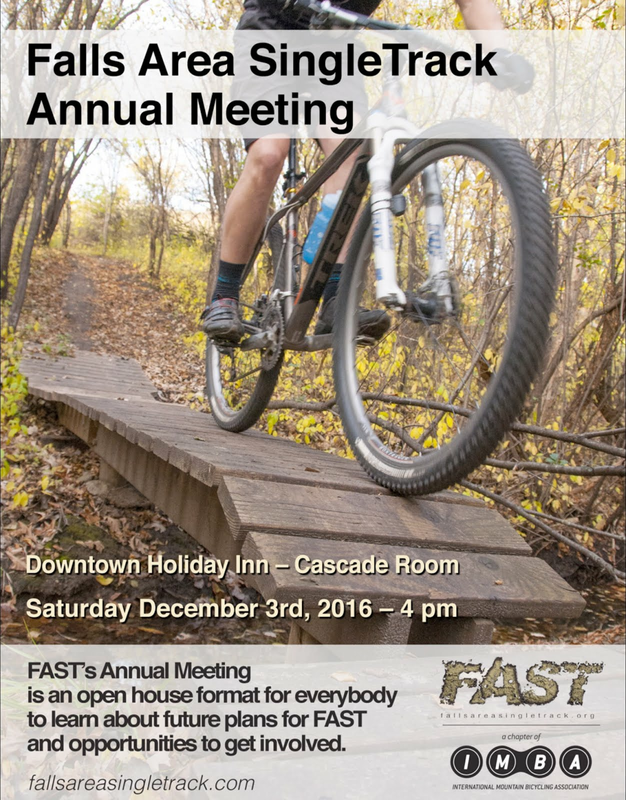 FAST is planning to start with Thursday night trail maintenance sessions next week, weather permitting. We'll keep you posted on schedule, timing and plans. Thanks to all vendors and supporters of the Sioux Falls Bike & Gear Swap last Sunday! We had a full room at the Downtown Holiday Inn and raised funds to keep FAST moving forward. The next swap is tentatively scheduled for March/April 2017!